An almost complete human skull fossil that could date back 100,000 years was unearthed in Henan last month, Chinese archaeologists announced yesterday. "It is the greatest discovery in China after the Peking Man and Upper Cave Man skull fossils were found in Beijing early last century, and will shed light on a critical period of human evolution," said Shan Jixiang, director of the State Administration of Cultural Heritage. All the fossils from Beijing were lost during the War of Resistance against Japanese Aggression (1937-45). 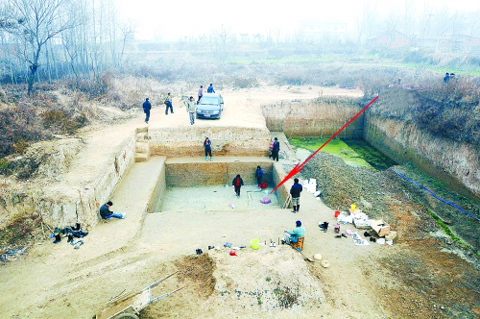 The Henan find was made after two years of excavation at the site in Xuchang. 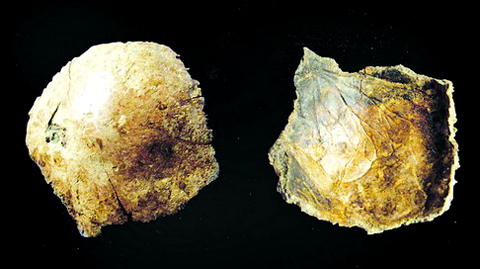 Archaeologists have worked on an area of 260 sq m, merely one-hundredth of the Paleolithic site. "We expect more discoveries of importance," said Li Zhanyang, archaeologist with the Henan cultural relics and archaeology research institute, who leads the excavation. The fossil consisted of 16 pieces of the skull with protruding eyebrows and a small forehead. More astonishing than the completeness of the skull is that it still has a fossilized membrane on the inner side, so scientists can track the nerves of the Paleolithic ancestors, Li said. The pieces were fossilized because they were buried 5 m near the mouth of a spring, whose water had a high content of calcium. Besides the skull, more than 30,000 animal fossils, and stone and bone artifacts were found in the small area in the past two years. The pieces of the human skull showed up just when archaeologists were going home for the Spring Festival. "It was freezing cold and digging was difficult. We planned to leave the next day when one of us saw something like part of a human skull," said Li. "It was 9 am, and only an hour earlier we joked and said: 'Let's get a skull today'." The Paleolithic site was discovered in 1965, when IVPP scientists found animal fossils and stone artifacts from soil dug for a well. Excavation started in June 2005. Five of the Peking Man in Beijing (dating back 200,000 to 700,000 years). Three of the Upper Cave Man, also in Beijing (about 18,000 years). One Jinniushan Man in Liaoning (150,000 years).